If you take the Nissan Rogue and the Mazda CX-5 and shrink them to "fun size," you get the Nissan Rogue Sport and the Mazda CX-3, both subcompact SUVs. They cost less than their bigger siblings and handle more like cars than SUVs. But which one in this class outdoes the other? If you like the look of the Nissan Rogue, you'll feel right at home inside a 2017 Nissan Rogue Sport. It features the same basic interior design, with quality, soft-touch materials and an airy, open feel. The Rogue Sport seats five with enough head and leg room to make all passengers happy. With 23 cubic feet of cargo space, just 10 cubic feet less than the Rogue, the Rogue Sport still has plenty of room for all the things you'll want to take with you or bring home. The 2017 Mazda CX-3's interior has been described as "edgy," "chic," and "upmarket." The CX-3 also seats five but the cramped back seat and small windows might leave some adults feeling claustrophobic. In terms of cargo space, it's far behind the Rogue Sport, with a little more than half the cargo space as the Rogue Sport. The standard Nissan Rogue Sport offers plenty of tech-friendly options, including Bluetooth, satellite radio, Siri Eyes Free, hands-free text messaging, and 5-inch audio display. If you want more, you can opt for features like a Wi-Fi hot spot, 7-inch touch-screen with NissanConnect, navigation, and voice command activation. Word to the wise: some users complain about the responsiveness and graphics of the infotainment system. Unfortunately, neither the Rogue Sport nor the CX-3 have Apple CarPlay or Android Auto for smartphone connectivity. 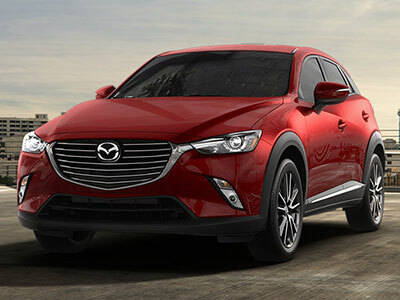 The Mazda CX-3 offers a similar tech package, including a six-speaker audio system, Bluetooth, 7-inch touch-screen infotainment system, and rearview camera as standard. Moonroof, automatic climate control, a seven-speaker sound system, satellite and HD Radio, navigation, and head-up display come as options. The Mazda Connect infotainment system is no better or worse than Nissan's system. The Nissan Rogue Sport gets 24 city, 30 highway miles per gallon, about average in its class. The Rogue Sport drives like a car, with an engine to match, making it less sporty than its name implies. The opposite can be said of the Mazda CX-3, which offers sporty handling and more power than you might expect for an SUV of this size. The CX-3 also saves you a little more at the gas pump: 29/34 miles per gallon. The Nissan Rogue Sport has yet to receive government safety testing, but the IIHS gave it top marks in every category and is expected to do equally well in other tests. 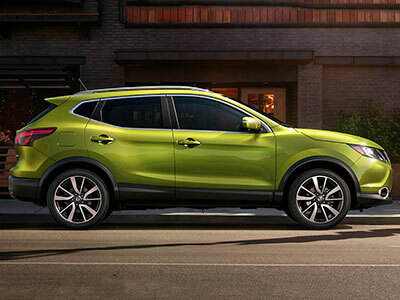 The Rogue Sport also offers the same great safety features as the Nissan Rogue, such as lane keep assist, driver drowsiness monitoring, automatic high beams, and assisted pre-collision braking system. The Mazda CX-3 also performed well in its safety tests, earning a five-star safety rating and the 2017 Top Safety Pick+ distinction. Its standard safety features include rearview camera and low-speed automatic emergency braking. The CX-3 only offers active safety features as an option. In our comparison, the Mazda CX-3 has more zip under the hood, but the Nissan Rogue Sport has more room inside and better features as well. If you're looking for something to eat up the road, the Mazda might be your thing. But if you want to ride in comfort for those weekend getaways, with enough cargo for all your stuff, look no further than the Nissan Rogue Sport.